For Parents: Help Your Child Success in School and in Life! while Increasing their Self Esteem and Confidence! SharperBrain Makes it Easy, Effective and Fun! No one likes to label a child. But unfortunately it happens all too often in today's school systems. Your constantly having to repeat yourself over and over again to your child. They seem so disorganized and can't seem to focus on their homework, which takes them hours to finish...not because it's particularly hard, but becaues they just can't "stick with it". Sound familiar? If you're the parent of a child with ADD, ADHD or LD, you know these scenarios all too well. "Her School Marks Have Improved Dramatically"
At the end of the third week we began noticing improvement in alertness, focusing and much less daydreaming. The first week back to school after the holidays Jenna was happy to report that she was able to concentrate in class with minimal daydreaming and found it easier to keep up and focus. In fact she said that the program showed her how her brain was supposed to feel while focusing and she would bring on that focusing feeling in class to get focused. She was also less tired at the end of the school day and very much less overwhelmed. She started doing her homework on her own more and more and even completed several assignments by herself. Her school marks have improved dramatically. How Can I Help My Child Be Their Best? Frustrated, many parents resort to medications or "quick" solutions like computer learning games. But this only makes the matter worse. Putting a child on medication can increase their risks of dealing with other problems later in life. In school, it could cause them to feel like they're in a "haze" or fall asleep. Not to mention that "stigma" of putting your child "on meds" -- like a last resort when nothing else would work. Video games can actually make the learning and attention problem worse, because stimulating images on a screen and "challenges" like a timed memory exercise, could lead to impulsive behavior and intense mental stress and tension. It works for children as young as 6 years old and works to combine a child's visual-motor (movement) skills, as well as audio-visual skills with integrated learning exercises. SharperBrain safely and gradually retrains their brain to pay attention in a fun and effective way - no matter what the subject matter. Compare this to a video game, which might hold their interest for a little while, but never really gets to the root of the problem - scattered brainwave patterns. What Do Brainwave Patterns have to do with Learning and Attention? As you can see, this leads to a lot of "mixed signals" and misunderstandings between the child, his or her teacher, and the parents. I purchased your program 3 months ago. I was really skeptical about it, but I thought I would give it a chance anyway. Well, I am glad I did. John (note: John is Mary's 12 years old son) came to me the other day and told me that he is feeling happier. I attribute it to his improvement in focus and memory since he started the program. We even have less arguments. This is incredible and I feel the need to thank you for all your help in making it work so successfully for John. Ryan gets picked last in gym class because he keeps losing the ball to the other team, and none of the other boys want to play with him. Common schoolyard struggles like these can wreck a child's perception of themselves and damage their self-esteem and confidence in ways that no parent can imagine. I want to thank you for your dedicated support in installing and using your SharperBrain program. SharperBrain is the best thing that happened to Paul (note: Paul is Brenda's 10 year old son). Not only is he so much more focused when studying, but he also seems to be much calmer. SharperBrain Can Help Reverse and Repair Attention and Learning Problems in a Way That's Fun and Engaging for Kids! Let's face it…kids today can play video games for hours. But all that playing hasn't cured their attention problems yet, has it? This is where other programs go terribly wrong. SharperBrain is different. In just minutes a day, children learn how to master those "switches" in the brain by learning when and how to be calm, be focused, and be alert -- situations that we all take for granted. How Soon Can My Child Start Using SharperBrain? 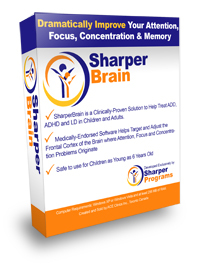 SharperBrain works for children as young as 6, and is a complete learning and behavior focus package. That means there's no additional equipment to buy and no extra modules for learning different tasks. Everything your child needs to be the sharp, creative, happy person you know they can be is wrapped up inside the SharperBrain program! Click Here to Order SharperBrain Now and Watch Your Child Start Feeling Great about Learning and Enjoying School Again! Listen to What Sarah Rowan, Mother of 9 Year Old Jonah, Had to Say About The Remarkable Results After Using SharperBrain with Her ADHD Son! Have Reported the Following Remarkable Changes! They understand directions more fully and completely. There aren't any "gaps" in what they are able to recall and what they complete. They can remember enough necessary information to do short tasks, and still retain it for longer assignments or projects without getting impatient or losing focus. They learn to relax, reducing their impulsivity and hyperactivity while concentrating despite other distractions. "He Has Improved so Much, I Can't Believe It!" Since we bought the Sharper Brain program a couple of months ago, my son (Note: Irshad's son is 10 years old) has improved so much in many different areas that my eyes just cannot believe what I see. He is beginning to manage his own time. He appears to have clear understanding of the task at hand and knows how to handle it by himself. By doing so he is getting more and more confident and as result our life has been less stressful. He is still practicing Sharper Brain on a daily basis as little as 20 minutes a day, he now scores 100 % sometime and other time just below that(90%-96%). The sessions he loves the most are the one where he has to listen and match color and sound. He also likes to do levels that involve multi-tasking. He makes it ok to make mistakes and then goes on to correct it the next time around. My son would really want to come one day and meet you and thank you for the wonderful program the ACE Clinic put together. I can say thanks but cannot say enough how SharpBrain has changed Sami's life within just 6 months. He has won 3 first prizes and some 2nd/3rd prizes in his Track and Field competition at his school. He finished 1st in 50 meter running, in jumping he finished 2nd and throwing he finished 2, and hitting target finished first. WOOOOOOOOOOOOOO. Before You Invest in Any Kind of ADD Treatment or Program - Get the Facts! Your Child's Well-Being Depends on It! Read comprehensive case studies with kids that shows proof that SharperBrain starts working to correct mental deficiencies immediately! What is Neurofeedback? - Discover how this breakthrough technology has changed the way we diagnose and treat ADD and ADHD. See the results of a follow up study we did with students aged 6-17 using the SharperBrain program. Read the medical endorsements and feedback from clients, teachers and parents just like you. Check out our Questions and Answers page to get the information you need to know about SharperBrain before you buy. See how SharperPrograms compares to ordinary brain fitness training! We're so certain you'll see a remarkable reduction of poor academic behavior and higher scores that if your child doesn't show an improvement after 6 months of using SharperBrain, we will refund your purchase immediately. Please see the details of the Money Back Guarantee for more information.